This sample price: priced within the past 7 days for arrival on Tuesday, October 29, 2019, departure from Los Angeles Intl, CA. Choose your own departure city and dates. Charms of Japan!...Start your trip inTokyo, the world's most populous metropolis and recently awarded as the city with best 'Helpfulness of locals', 'Nightlife', 'Shopping' and 'Best Local Transportation'. Then take the train to Kyoto, known as the City of the Ten Thousand Shrines for a reason! Since it holds about a quarter of Japan's National Treasures and popular festivals. Up next roll-on to Osaka, famous for its delicious traditional food along with its Castle and renowned Osaka Aquarium Kaiyukan. Then comes Hiroshima followed by Nagasaki, both historic places that I will venture to call the 'Phoenix Cities', which have emerged from the ashes to become beautiful modern cities. An unforgettable journey to any! 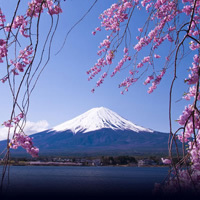 Japan consists of four main islands: Hokkaido, Honshu the main island, Shikoku, and Kyushu. More than 4,000 smaller islands surround these four main islands. A modern country with a rich cutural heritage, Japan has long been popular with tourists. From city based attractions in Tokyo, all the way to the natural wonders like Mount Fuji and the hot springs of Beppu, this country has something for everyone. Technology lovers will love Japan, being the heart of all techological development, tourists greatly enjoy the diversity of shopping in Japan. Between the neon signs and the skyscrapers you will be surprised to discover pagodas and shrines where saints are venered according to century old customs.